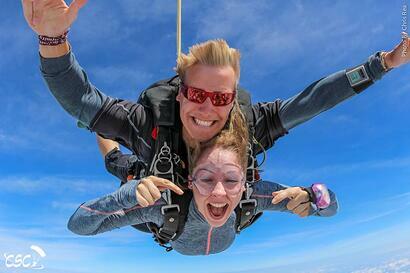 Need Help Convincing Your Friends to Join Your Group Skydive? Here’s How! Fear is totally normal. The feeling comes more from the uncertainty about the activity than anything else. Luckily, the math proves that the actual risks of tandem skydiving are much milder than your friends might imagine. For example: If we look at just the past decade, with a rate of only 0.003 fatalities per 1,000 jumps, you are more likely to get killed being struck by lightning or stung by a bee. On top of it, Chicagoland Skydiving Center boasts a perfect tandem skydiving safety record, and we're darn proud of it. Many studies show that people who experience adrenaline-filled experiences together, develop a stronger bond. Share the thrill, and enjoy the connection you’ll have for life. Help them understand what to expect. Let them know that they’re welcome whether or not they jump. No worries: it’ll be fun for everyone. Chicagoland Skydiving Center was designed to be uniquely spectator-friendly, so everyone can enjoy the overhead activity in comfort (with Wi-Fi, food, and drinks). The courtyard, private tent and patio bar overlook the skydiver landing area. If it's more your style to sip on a cold beer while the crazy people jump from airplanes, that's totally cool. HOLD YOUR SPOT, PAY WHEN YOU CAN. Creating a group reservation on our website is easy. You pick the day, time, and number of people, and we'll give you a code you can share with your friends to go online and grab their spot. Anyone who wants to go just needs a $50 deposit up front, so you've still got time for a few more paychecks and home-made lunches to save up the rest. Our website will automatically adjust pricing if you reach the next level for a bigger group discount. Get started with your skydiving reservation. CSC offers free round-trip shuttle service from downtown Chicago. No car? No problem. Want to celebrate with your friends post-jump? You've got a designated driver. It's a 14-passenger van, so load it up! Our standard Chicago pick-up/drop-off point is at the University of Chicago Gleacher Center located at 450 North Cityfront Plaze Drive. For exclusive groups, it may be possible to ammend the pick-up/drop-off location. A shared tandem skydive with close friends is one of the most powerful bonding moments you’re ever going to experience. We highly recommend it -- and we want to help! Need an extra boost? Chat to one of our staff for more pep-talk advice. Load up a plane with your best friends. Find out how! 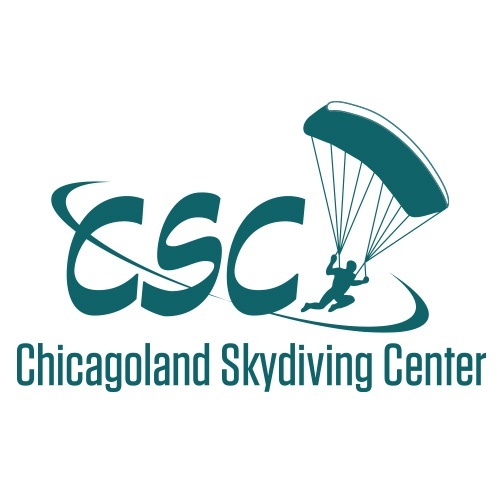 Chicagoland Skydiving Center is the original Chicago skydiving school. The company has introduced more than 300,000 people to the sport since 1968. With a 20,000sq ft campus in Rochelle, Illinois, perfect tandem safety record, highest industry standard in customer service, numerous annual events, award-winning aircraft, and a full service restaurant and bar on-site, CSC is the premier skydiving destination in the region.